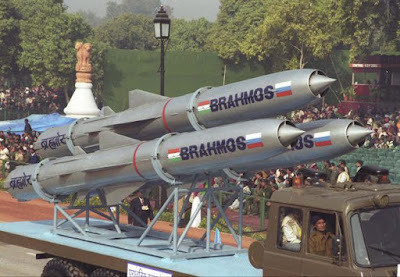 BRAHMOS, the first supersonic cruise missile in our world, is named from the two rivers (BRAHMaputra of India and MOSkava of Russia).These missile are developed by DRDO (defence research and development organisation) with help of Russia and are similar to sea-skimming Russian cruise missile technology. It has a two stage propulsion system, with solid propellant responsible for initial acceleration and liquid fuelled ramjet for responsible for sustainable supersonic trust production. It can attack surface targets by flying from 5 m to 14000 m height. It has 70 cm diameter. It is a far better cruise missile than Tomahawk (created by USA), because it can attack the target efficiently and 32 times speed than tomahawk. These missiles are launched from sea and land. Indian and Russian governments have decided to create 2000 missiles over 10 years. In Future Indian Government will be export these missiles to countries like Bhutan, Bangladesh, Vietnam. These missiles are of great strategic importance to India. In 2016 India joins MTCR (Missile Technology Control Regime). Also, Russia and India are develop to create new generation missile and able to hit target with accurately. BRAHMOS II and BRAHMOS - NG are examples of these type of cruise missiles.